Feel like sub-$200 is the magical price for a netbook? With a coupon code, you can pick up a refurbished Dell Inspiron Mini 9 (with the same one-year warranty as new goods) for $177. UPDATED. Update: It might look like they're out already of the absolute cheapest models, but just keep refreshing, they're adding more constantly. 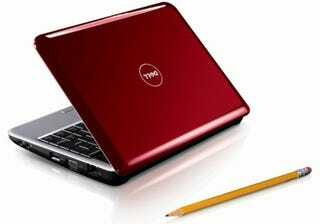 Dell's outlet site is a pain in the peen to get around, so here's the direct link to the Inspiron Mini 9 shopping page. And even it's a flustercuck. You're basically trolling through their inventory until you find the one you want, which the $209 model with 4GB of storage and Ubuntu. The first time I picked one and added to cart, some dude apparently grabbed it before me, so I'd check two or three to add to your cart, then just delete the extraneous ones. Then just add the coupon code $C$TXXP1CT3BLC which will knock the price down to $177 for up to two notebooks in your cart.